Welcome to Indiana. Please turn your clocks back 50 years. Actually, scratch that. Set your clocks back to just a little over a month ago to Tuesday, February 19. This was the day the Indiana State Senate passed State Bill 568 – the state-level version of the Religious Freedom Restoration Act (also known as the RFRA, "Rif-ra! ", and The Hobby Lobby Law). Now jump ahead three weeks, to Monday, March 16, the day the Indiana House of Representatives passed the bill, which was retitled State Bill 101— essentially the same legislation as 568, just handled by a different branch of the government. And from there, zoom to March 26, 2015, the day Indiana Governor Mike Pence — despite waves of public outcry on a national level – signed the Religious Freedom Restoration Act into effect. Okay. Now you can go back 50 years in time. Essentially, this means that, while freedom of religion is an unalienable right all Indiana citizens shall enjoy, freedom to be a minority is not. Because it “burdens” another person’s religious rights. They ignored huge job creators and small businesses. They ignored churches and other institutions of faith. They dismissed the idea that a license to discriminate would make us unappealing to visitors and potential residents. Sure enough, the law's consequences have already began to take effect: Salesforce.com’s CEO Marc Benioff immediately withdrew his multi-billion-dollar company’s events from the state. In an interview with Re/Code, he then threatened the state with a "slow-rolling of economic sanctions" if the law is not thrown out. It should be noted that Benioff's warnings began well before the day Pence was to sign the bill. Regardless, Governor Pence ignored them, making it clear to Indiana that he was complacent in not one, but two serious matters: unlawful discrimination and economic forfeiture. Along with Benioff, the organizers of global gaming-centric Gen Con — Indianapolis’ largest convention both in size and economic sway — likewise threatened to relocate. George Takei is now urging them to follow through. The price tag on their departure? Fifty million dollars. While the law’s damaging effects on the local economy are disheartening to say the least, the effect it will soon have on hundreds of thousands of citizens is, by far, much worse. "Indiana workers, families, and others will be vulnerable to the whims of anyone claiming a religious reason for ignoring state or local laws,” said Jennifer Pizer, National Director of Lambda Legal’s Law and Policy Project. It's also about respect. And, quite simply, the RFRA is disrespectful toward a large portion of the state's population. It isn't going to affect just the LGBTQ community; religious and ethnic minorities are vulnerable to the law's discriminatory impact as well. While proponents of the law argue that 19 states already have the Religious Freedom Restoration Act, what they fail to mention is that, since it’s federal invocation in the Hobby Lobby case, the new states pushing the RFRA (Indiana being one, of course) are calling for stronger measures. Think of it as the Religious Freedom Restoration Act on steroids. Indiana policy makers perceived the federal support of the law as permission to test its limits on a state level, using vague, indefinite language as their means to discriminate. Many opponents of the SB101 were hopeful — myself included — that Governor Pence would have a “Jan Brewer” moment and decide in the eleventh hour to veto the law, following in the footsteps of Arizona’s Republican governor Jan Brewer, who vetoed a similar bill in February 2014. Unfortunately, that moment didn’t come. I reached out the Freedom Indiana’s Jennifer Wagner to find out what opponents of the law are doing next. A petition is also circulating calling for Governor Pence's recall. As of the evening of March 26, it has 50,482 signatures. Its goal is 75,000. 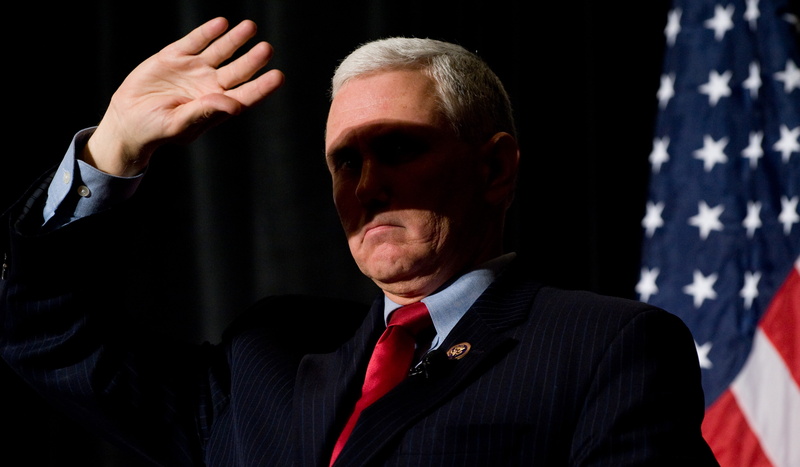 Also, not to be ignored, is this charming, aptly suggestive piece from Persephone Magazine entitled, “Dear Indiana Governor Mike Pence, Get Fucked.” If you can’t make the protest or sign the petition, at least read this post.